In March 1958 the New York Times reported, "Formation of a car and truck rental company, the Bates Auto Rental Corporation, has been announced by Edward E. Bates, president of the Bates Chevrolet Corporation, New York Chevrolet dealer. Mr. Bates said that the new concern, a subsidiary of Bates Chevrolet, will operate on a national scale." Edward E. Bates, the president of the Bates Chevrolet dealership, was Edward Escalante Bates (1899-1972). He was born in Mexico, the son of Nicholas Escalante Bates (1869-1947), himself a native of Mexico. Nicholas Bates applied for a passport in 1912 when he declared that he was born in Mérida, Yucatan, Mexico, 11 Dec. 1869. He was an exporter living in New Rochelle, Westchester County, New York, had emigrated on the City of Puebla from Progreso, Mexico, on the 17th of May 1886, and had become a naturalized citizen of the U. S. in New York, 23 Nov. 1909. On his death in 1947, the following obituary appeared in the New York Times, 25 Jan. 1947, "West Palm Beach, Fla., Jan. 24 - Nicholas E. Bates, retired developer and owner of a railroad, bank and silver mine in Yucatan, Mexico, died here this morning at his home of a stroke. His age was 77. Born in Yucatan of American parents, Mr. Bates came here five years ago from New York. Surviving are three daughters, Miss Marie E. Bates, Mrs. Edgar Bright of Marblehead Neck, Mass., and Miss Mercedes Bates of New York; two sons, Edward Bates of Rye, N.Y., and William Bates of New York; five brothers and two sisters." The Bates family was recorded in the U. S. Census of 1920 living in New Rochelle, NY. Nicholas Bates, age 50, lived with his wife, Pilar, and their six children, consisting of Nicholas Jr., age 25, Marie, 24, Edward, 20, Mercedes, 17, Zoila, 15, and William, 14. All had been born in Mexico and had immigrated in 1907. Nicholas was an importer, and Nicholas Jr. and Edward were exporters. The Bates were also recorded in the 1930 census, when Nicholas Bates lived at 118 Riverside Drive, Manhattan. Edward Bates now had his own home at 1160 Park Ave., Manhattan. His occupation was recorded as "Automobile Distributor." His younger brother, William, age 24, still lived with his father, and his occupation was recorded as "Salesman, Automobiles." By 1930 Edward and William Bates were involved in the Bates Chevrolet dealership. Bates Chevrolet was in business on the Grand Concourse in the Bronx from approximately 1923 to 1976. In 1924 the New York Times reported that Bates Chevrolet would occupy the corner store in a new building nearing completion at the southeast corner of 188th St. and the Grand Concourse in the Bronx. This ad for Bates Chevrolet appeared in the Manhattan telephone directory in 1933. Their location at the Grand Concourse and 188th St. is referred to as the Fordham Branch. The younger brother was William Alexander Bates (1906?-1949). On his death the following appeared in the New York Times, 25 Feb. 1949, p. 23, "William Alexander Bates of 3010 Valentine Avenue, the Bronx, general manager of the Bates Chevrolet Corporation, 393 Grand Concourse, the Bronx, died yesterday at Doctors Hospital, Manhattan. His age was 43. Mr. Bates had been manager of the firm all his business career. He was born in Mexico and brought here as an infant. He leaves his wife, Mrs. Helen Conboy Bates; a brother, Edward E. Bates, president of the Chevrolet firm, and three sisters, Marie and Mercedes Bates and Mrs. Edgar E. Bright." On his death, the following death notice for Edward Bates appeared in the NY Times, "Bates - Edward E. on September 11, 1972. Beloved husband of Dorothy Flood Bates, devoted father of Wendy Anne Bates. Loving sister [sic] of Mrs. Cambra Chan, Mercedes Bates and Mrs. Edgar Bright..." "Sister" was corrected to brother the following day. In 1926 plans were filed with the New York City Department of Buildings for a three-story brick garage and storage at 204 W. 101st St. The architect listed on the plans was Emery Roth, a well known New York architect of the time. The following year plans were filed for a one-story brick garage to run through the block at 204 W. 101st St. to 207 W. 100th St. Whether either or both of these were actually built is open to question, but in 1929 a garage called the Beau Park Garage opened at 204 W. 101th St. This name was retained for the garage in this location until the middle 1970s. 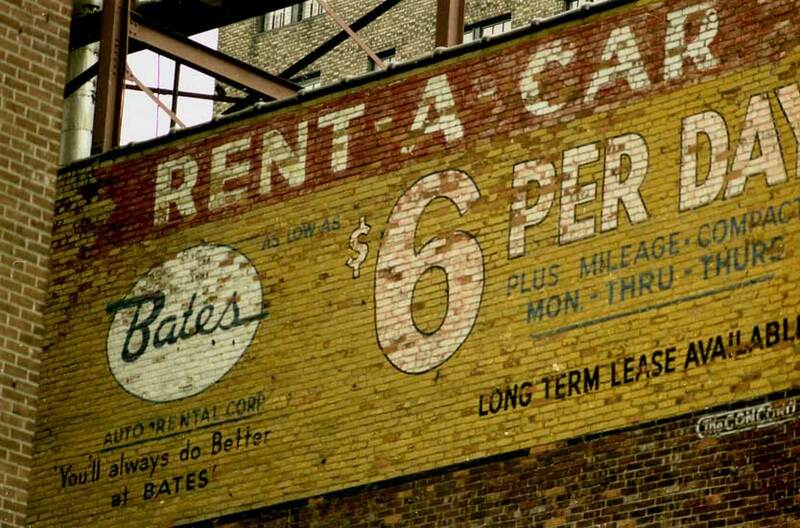 Telephone listings for Bates Auto Rental ran from 1958 to 1965, but no listing appeared that located the company on W. 101st St. The Bates Chevrolet dealership was listed in the Manhattan telephone directory at 391-393 Grand Concourse, the Bronx, until 1961. This ad for Bates Chevrolet appeared in the Manhattan telephone directory in 1953.